Solar Photovoltaic (PV) technology already plays an important role as a solution for the increasing global energy demand (projected as high as 36.5 Trillion kWh by 2040 – International Energy Outlook, 2016). It is therefore fundamentally important to combine environmentally friendly base materials with higher conversion efficiencies at the lowest possible cost in their production. In this regard, Colombia is a privileged country, sinceit has a wide variety of energy resources available. However, our current energy matrix is mostly comprised of hydropower, fossil fuel and coal, followed by a minimal 1% of non-conventional power source, of which solar PV is included. Considering that the average solar radiation value for Colombia is 4.5kWh/m2, which is relatively high, solarPV could contribute up to 20.6% to our energy matrix in the future. But it is also important to know that a high percentage of the most isolated areas in the country do not have access to the National Grid. Given that, it is easy to understand why our solar PV landscape consists of just a few MWp installed on-grid systems, outnumbered by thousands of small stand-alone units for household consumption. Also worthy to mention, the vast majority –if not all- of these units use imported silicon-based solar panels. Nevertheless, new legislation seeks to broaden the usage of PV technology in Colombia. Currently, local industries are incorporating PV units to support their production processes. 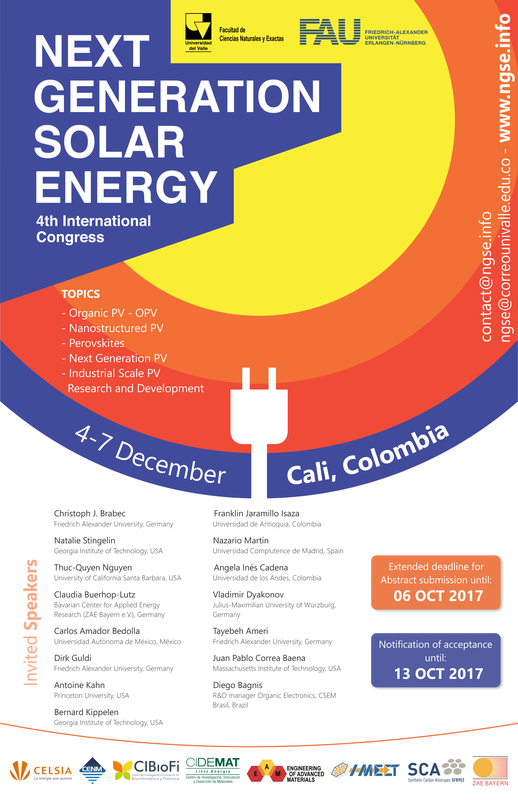 Moreover, there´s interest and local capacity in the Colombian Academic community to investigate and develop solar technology, such as passive solar construction materials and BIPV (Building-integrated PV). Besides the governmental perspective for investment on societal and business projects in solar energy, education also plays a strategic key for the consolidation of environmental sustainable development of the country. That´s why we organize in this year, the 4th international congress “The Next Generation Solar Energy (NGSE-2017)” in Cali, which is an amazing opportunity to gather globally recognized experts of the PV field, coming from academia and industry, in order to discuss novel research, concepts and developments in photovoltaics and BIPV and contextualize their future application and the challenges in manufacturing processes. Additionally analyzing what advantages, the current trends in relation to different materials, namely perovskites, organic materials, light-absorbing dyes, quantum dots and tandem / multi-junction solar cells, they offer over Si-based PV. The NGSE-2017 in Cali will follow a format over three full days, with plenary sessions for invited speakers (45 min. ), contributed talks (15 min. ), as well as a room for poster presentation. There will also be the opportunity for industrial exhibitions. It is the aim of this congress to connect at an early stage, world-class science and business in the area of next generation solar energy, in order to further support its technological and commercial development. The goal is to incubate new projects in the growing field of next generation photovoltaics. 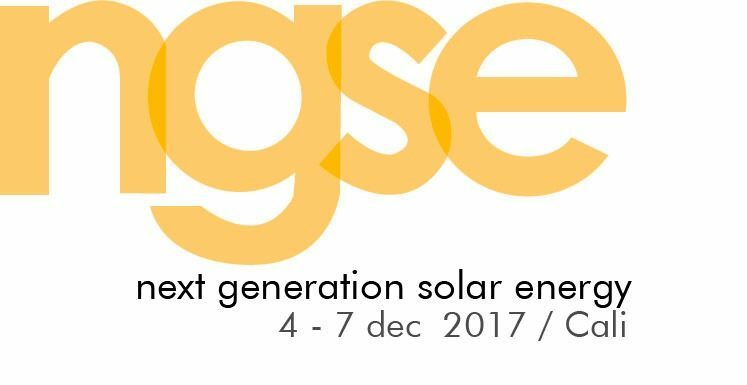 The NGSE-2017 offers an excellent opportunity to learn about the latest developments and current projects in this field, and to exchange ideas and experiences with experts from around the world.